Two Martin 4-0-4 planes were charted from the Jack Richards Aircraft Company to fly the Wichita State University football team to Logan. Both aircraft were piloted by flight crew from Golden Eagle Aviation. The first officer for N464M was the president of Golden Eagle Aviation. After a ferry flight from Oklahoma City the passengers boarded the planes at Wichita. Both aircraft proceeded toward Denver for a planned refueling stop. En route to Denver, the first officer of N464M, while visiting with passengers in the cabin, advised some of them that the flight would take the "scenic route" from Denver to Logan and that he would point out the ski resorts and significant points of interest. On arrival at Denver at approximately 11:19, both aircraft were serviced with fuel and oil. The First Officer of N464M then purchased aeronautical sectional charts for the contemplated scenic route. The other Martin, N470M, took off from Denver and proceeded to Logan according to the original flight plan. N464M, with the first officer acting as pilot flying in the left hand seat, departed from runway 35 at 12:29. Enroute to Logan, the flight turned slightly south, off the airway, to go through a pass in order to follow a valley. After intercepting Clear Creek Valley, the flight proceeded along US Highway 6, slightly south of it, past Georgetown and Silver Plume, toward Loveland Pass. The elevation at Georgetown is 8,512 msl and at Silver Plume is 9,118 feet msl. Thereafter, the valley floor continues to rise, reaching an elevation of 11,990 feet msl at Loveland Pass. In the vicinity of Dry Gulch the first officer noticed that they would probably not be able to clear the Continental Divide ahead. He then initiated a turn to right. After rolling out of the turn the captain took control and initiated a left turn during which the plane began to vibrate. The captain then put the nose down following which the plane struck trees at the 10,800-foot level on Mount Trelease (elevation 12,447 feet msl) in a 31-degree left bank and a 4-degree angle of descent and cut a 425 feet swath through the timber. PROBABLE CAUSE: "The intentional operation of the aircraft over a mountain valley route at an altitude from which the aircraft could neither climb over the obstructing terrain ahead, nor execute a successful course reversal. 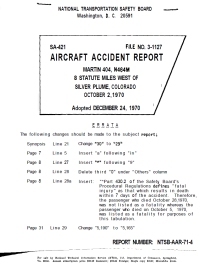 Significant factors were the overloaded condition of the aircraft, the virtual absence of flight planning for the chosen route of flight from Denver to Logan, a lack of understanding on the part of the crew of the performance capabilities and limitations of the aircraft, and the lack of operational management to monitor and appropriately control the actions of the flightcrew." Distance from Denver-Stapleton International Airport, CO to Logan-Cache Airport, UT as the crow flies is 623 km (390 miles).